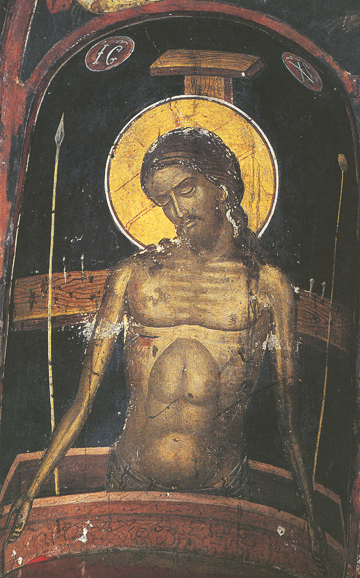 Here Christ is depicted descending into Hades bearing the instruments of the Passion: the Cross, the spear, the sponge, and the nails. His hands are extended with palms outward and open, peaceful now after His voluntary frightful suffering and Death on the Cross for the salvation of all. We see the bleeding wounds on His side and hands, for He has kept His wounds even in His Resurrection as a sign that His agony and suffering were real, and they remain as a pledge of His undying Love for each person, even to His Death on the Cross. With His eyes closed He is truly dead to the world and all of its passionate needs during His descent into Hades, yet inwardly beholding all things as the all-seeing God.